Signaling through the vitamin D receptor has been shown to be biologically active and important in a number of preclinical studies in prostate and other cancers. Epidemiologic data also indicate that vitamin D signaling may be important in the cause and prognosis of prostate and other cancers. These data indicate that perturbation of vitamin D signaling may be a target for the prevention and treatment of prostate cancer. Large studies of vitamin D supplementation will be required to determine whether these observations can be translated into prevention strategies. This paper reviews the available data in the use of vitamin D compounds in the treatment of prostate cancer. Clinical data are limited which support the use of vitamin D compounds in the management of men with prostate cancer. However, clinical trials guided by existing preclinical data are limited. A potential role for vitamin D compounds in the causation and treatment of cancer has been considered since the early 1970s. Treatment with vitamin D compounds was shown to inhibit the development of cancer in a carcinogen-induced model in the hamster; vitamin D receptor (VDR) was detected in human cancer cells and growth arrest in vitro.,, This paper seeks to provide an overview of studies of vitamin D in prostate cancer. However, given the ubiquitous expression of VDR as well as the vitamin D synthesizing and degrading enzymes (e.g., CYP 24a1, CYP27b1) in almost all human tissues, and cancers that arise from those tissues, there is every reason to believe that vitamin D signaling may play a role in the genesis, outcome, and treatment of other types of cancer. Vitamin D compounds are important components of the vitamin D hormone system. Vitamin D is synthesized in the body through a complex series of steps beginning in the skin under the influence of ultraviolet light, when a cholesterol precursor molecule (7-dehydrocholesterol) is changed into the vitamin D hormone precursor, cholecalciferol (vitamin D3). Hence, strictly speaking, vitamin D is not a vitamin. Vitamin D3 is subsequently hydroxylated in the liver (yielding 25(OH)D3) and then in the kidney to yield the most active hormone form of these compounds, 1,25-dihydroxycholecalciferol or calcitriol. “Inactivation” of calcitriol and other vitamin D compounds is accomplished primarily by 24-hydroxylation yielding 1, 24, 25(OH) cholecalciferol; this step also occurs predominantly in the kidney. These hydroxylations are mediated primarily by cytochrome P450 (CYP) enzymes CYPR1, CYP27B1, and CYP24A1, respectively. As is the case for estrogenic and androgenic hormones, while major organs of metabolism and excretion are liver and kidneys, tissue level and even tumor cell and microenvironment cells may also metabolize these hormones. Vitamin D hormones are transported in the circulation bound to vitamin D-binding protein (DBP or Gc-MAF), a multifunctional protein in the albumin family. Alternatively spliced transcript variants encoding different isoforms have been found for the gene encoding this protein, and the prevalence of expression of these isoforms varies among different racial and ethnic groups. The physiologic importance of these differences is unclear. 25(OH)D3 is the compound measured in the blood to assess “vitamin D sufficiency” status. While the liver and kidneys are the predominant sites of D3 metabolism, it is important to realize that these CYP enzymes are expressed in most tissues studied; extrahepatic and extrarenal production and catabolism of vitamin D hormones has been shown to occur, may be relevant in disease, and is a potential therapeutic target. There is also the potential for genetic variants of these metabolizing enzymes and the Gc transport protein to result in complex combinations of moieties that may impact tissue-specific vitamin D hormone signaling. After 1,25D3 enters cells, primarily by passive diffusion, it binds to the VDR which then heterodimerizes with the retinoid X receptor (RXR) and its cognate ligand, 9-cis-retinoic acid. This complex binds to promoter regions of vitamin D-responsive genes to modulate gene expression. More than 2000 genes are modulated by 1,25D3. The complexities of variants in D3 metabolism, protein binding, partner heterodimerization, and the multitude of genes modulated by the vitamin D hormone systems suggest that dissection of the role of this system in cancer or other diseases will require very careful and detailed study. One of the reasons to examine the role of vitamin D in prostate cancer is the large number of epidemiologic studies linking vitamin D and prostate cancer risk and outcome. Similar to the case in many other tumors (e.g., colorectal, breast, lung, and non-Hodgkin's lymphoma), studies have reported a higher risk of prostate cancer or lethal prostate cancer in men living in Northern latitudes, and higher overall prostate cancer risk and/or poor prognosis among men whose estimated vitamin D intake is low or in whom 25(OH)D3 has been measured. One of the most persuasive cases for an association between vitamin D and prostate cancer is based on studies of African-American men. In these men, 25(OH)D3 levels are often low (primarily due to the effect of skin pigmentation reducing intracutaneous synthesis of vitamin D), and prostate cancer risk and mortality are clearly higher than that of Caucasian men. While this relationship has been described many times, the mechanisms for this association are unclear. Clearly, a factor contributing to unfavorable outcome among African-American men is disparities in access to medical care. If it was true that reduced serum levels of 25(OH)D3 contributed to the risk of prostate and other cancers, one would imagine that isoforms of vitamin D-metabolizing genes and perhaps even vitamin D-binding protein might be associated with different cancer risks or outcomes. While there are clear associations between polymorphisms in vitamin D pathway genes and vitamin D serum levels, an association between such polymorphisms and prostate cancer risk or prognosis remains elusive. The VITAL study (vitamin D and OmegA-3 Trial, a randomized trial in 20 000 individuals who are 55 years of age or greater and who receive 2000 IU vitamin D3 or omega-3 fatty acid or both or placebo) provides important information regarding the role of vitamin D supplementation and the risk of cancer and cardiovascular disease. This is a very important trial for two critical reasons: (1) the accrual objective is sufficient to make it likely that the effects of supplementation will be able to be determined with substantial statistical power; (2) it is the one of only two “large” trials in which individuals receive a dose of vitamin D likely to raise the 25(OH)D3 level in most patients. The outcomes of this trial will do much to clarify the role of vitamin D supplementation on health outcomes. Inecalcitol (TX 522) has been tested clinically, a safe dose has been defined (4000 mcg daily [QD]), and a Phase II trial in combination with docetaxel suggests that this combination is superior to docetaxel alone., A definitive trial has not been done, however. While appealing conceptually, 1,25(OH)2D3 analogs have not been evaluated in a way as to prove that for equitoxic doses of an analog and parent compound, the analog has antitumor activity superior to 1,25(OH)2D3 or that the potential for a given analog to cause hypercalcemia is less than 1,25(OH)2D3, when given at “equi-effective” antitumor doses. Much of the apparent reduction in the potential to cause hypercalcemia for many analogs can be explained by differences in protein binding and catabolism of analog compared to the parent compound. For example, “resistance” to CYP24A1 breakdown will extend the half-life of an analog intracellularly. Resistance to CYP24A1-mediated catabolism would mean that a given concentration of an analog would be “more potent” since intracellular removal would be delayed. Such compounds would likely cause more hypercalcemia at a molecularly equivalent dose of 1,25(OH)2D3. Similarly, if an analog is more tightly protein bound, it will take a larger dose of said analog to cause hypercalcemia in an intact animal, since the active moiety of a drug is that portion which is “free” and physiologically active in tissues. Demonstrating that the dose of an analog which causes hypercalcemia is larger than the dose of calcitriol that causes hypercalcemia does not establish that an analog is intrinsically “less hypercalcemic.” Ma and colleagues have demonstrated that inecalcitol and calcitriol have different maximum tolerable doses in mice and that antitumor effects of inecalcitol were seen at lower concentrations of this agent than calcitriol. However, in a xenograft model of squamous cell carcinoma, doses of these two compounds that caused similar degrees of hypercalcemia also had similar antitumor effects. No vitamin D analog has been developed which clearly dissociates the hypercalcemic effects of the agent from the anticancer or other biological effects. As will be discussed below, the clinical activity of 1,25(OH)2D3 and analogs has been much harder to demonstrate than might be expected given the extent of the preclinical data indicating substantial anticancer effects. One of the factors contributing to this could be the existence of substantial “resistance” mechanisms which may confound the clinical trials. Resistance to the antiproliferative effects of vitamin D analogs has been demonstrated in a number of preclinical models –in vitro and in vivo. The two best-characterized mechanisms of resistance to vitamin D compounds are loss or diminished function of VDR and enhanced CYP24A1-mediated catabolism. The absence or diminished expression of the VDR is clearly associated with diminished responsiveness to vitamin D analogsin vivo and in vitro., Polymorphisms in VDR structure and varying levels of cofactors important in vitamin D signaling could change the sensitivity of tumor cells to 1,25(OH)2D3. In a related fashion, treatment with a proteasome inhibitor, which impedes degradation of intracellular proteins, enhances the intracellular content of VDR and potentiates the antitumor effects of calcitriolin vitro in a bone tumor cell line. Ajibade and colleagues presented an interesting study, which from the standpoint of tumor biology is entirely plausible and not unexpected, but provides a cautionary note in the study of broadly active biologic agents in cancer therapy. In a transgenic murine model of prostate cancer (TRAMP), these investigators found that calcitriol and the calcitriol analog, QW, when administered weekly to 4-week-old mice inhibited the growth of prostate cancer (as indicated by reduced urogenital tract [P=0.0022 for calcitriol, P=0.0009 for QW] and prostate weights [P=0.0178 for calcitriol, P=0.0086 for QW]). Neither vitamin D compound had any effect on castration-resistant TRAMP prostate cancer. In a second experiment, TRAMP mice were treated for 20–25 weeks with calcitriol and the number of distant organ metastases was enhanced (P = 0.0003). These data suggest that the effects of 1,25(OH)2D3 may differ in this model between castration-responsive and castration-resistant populations. While 1,25(OH)2D3 compounds have shown encouraging activity in preclinical models, single agents usually have limited effect in clinical cancer therapy. 1,25(OH)2D3 compound-based combination therapies are being explored and enhance antitumor efficacy. Nonspecific (e.g., ketoconazole) P450 inhibitors reduce the activity of CYP24A1 and accentuate the antitumor activity of liarazole and calcitriol. Specific inhibitors such as secosteroid derivatives of 1,25(OH)2D, as well as natural products such as soy or its component isoflavones such as genistein and daidzein and also progesterone all inhibit CYP24A1 (directly or indirectly) and potentiate the antitumor effects of vitamin D compounds.,,,,,,,,, The combination of calcitriol and genistein (which competitively inhibits CYP24a1 activity) synergistically inhibits tumor growth in human prostate models., Muindi and colleagues clearly demonstrated in a prostate cancer model (PC-3) that ketoconazole potentiates the antitumor effect of high dose, intermittently administered calcitriol. Clinical evaluation of this regimen is ongoing. As noted above, inhibition of prostaglandin synthesis may potentiate the activity of vitamin D compounds. A Phase II trial evaluating the combination of the nonselective nonsteroidal anti-inflammatory drug (NSAID) naproxen and high-dose calcitriol in patients with early recurrent prostate cancer demonstrated some benefits in terms of reduction in prostate-specific antigen (PSA) doubling time. Studies,in vitro and in vivo, show that vitamin D compounds potentiate the cytotoxicity of many anticancer agents; substantial potentiation and often synergy has been reported with the combination of calcitriol or other 1,25(OH)D3 analogs and platinum compounds (cisplatin [Platinol®] and carboplatin [Paraplatin®]), anthracyclines (doxorubicin [Adriamycin®] and mitoxantrone [Novantrone®]), topoisomerase inhibitors (irinotecan [Camptosar®] and etoposide [Etoposide®]), antimetabolites (cytosine arabinoside [Cytarabine®], gemcitabine [Gemzar®], and 5-fluorouracil [Adrucil®]), and taxanes (docetaxel [Docetaxel®] and paclitaxel [Taxol®]). This interaction is associated with increased expression of p21 and perturbation of cell cycle kinetics, enhanced induction of apoptosis, and increased expression of p73.,,,,,,,, These effects are most pronounced when vitamin D compounds are administered before or simultaneously with the cytotoxic agent [Table 1]. Maximum exposure to 1,25(OH)2D3 compounds in animal studies is achieved if these agents are administered on an intermittent schedule. For example, clinical trials demonstrate that the maximum oral dose of calcitriol is 1.5–2.0 mcg QD (~14 mcg per 2 weeks). In contrast, intravenous calcitriol at a dose of 74 mcg weekly is safe and well tolerated (144 mcg per 2 weeks). 125 mcg per week is safe if combined with dexamethasone (250 per 2 weeks). Muindi and colleagues demonstrated that the systemic exposure to calcitriol achieved in murine models in which calcitriol is effective in suppressing cancer growth can be achieved in humans at high, but safe and tolerable oral and intravenous doses of calcitriol. Calcitriol, 1α-hydroxyvitamin D2(doxercalciferol), and 19-nor-1alpha-25-dihydroxyvitamin D2(paricalcitol) have been evaluated as single agents in patients with castration-resistant prostate cancer (CRPC) and castration-sensitive disease [Table 2]. While a decrease in the rate of PSA rise in the castration-sensitive setting and some evidence of activity in CRPC (19% PSA response rate),,,,,,,,, none of these studies provides convincing evidence of clinically important single-agent activity of calcitriol. Confounding the analysis of single-agent activity of calcitriol has been the fact that it has been combined with glucocorticoids in most studies. This was done to facilitate maximum, safe calcitriol dosing, as glucocorticoids have been shown to block the hypercalcemic effect of calcitriol. However, since glucocorticoids have anticancer activity in men with prostate cancer, determining the calcitriol response rate in single-arm studies using calcitriol + dexamethasone is problematic. In large trials in which single-agent glucocorticoids have served as the control arm for testing new agents, PSA response rates have been reported in the range of 3%–10%.,,, In view of these data, one might conclude that a PSA response rate of 19% following calcitriol po + dexamethasone is “interesting.” However, in multiple small studies of glucocorticoids alone, rates of 25%–45% are reported.,,,, Factors contributing to this wide variation in PSA response with glucocorticoids include the small number of patients entered on many trials, the variation in prior treatment and extent of disease, even though all were castration resistant. There are intriguing data that response rates following different glucocorticoids may differ. In summary, however, the data indicate a response rate to calcitriol + dexamethasone that is difficult to distinguish from the rate one might expect with dexamethasone alone. Gross et al. studied androgen deprivation therapy (ADT)-naïve patients and noted a decrease in the “rate of rise” of PSA. While intriguing, this is a measure of uncertain significance in such patients. As was noted in the study of Ajibade et al., calcitriol and a related compound had different effects in castration-naive and castration-resistant prostate cancer; the same could be true in men with prostate cancer. Most studies of calcitriol alone have been conducted in men with castration-resistant disease. 1 alpha (OH) vitamin D2(doxercalciferol) has been studied as a single agent in CRPC (12.5 mcg orally QD). Among 26 patients, there was no evidence of antitumor activity and no substantial decreases in PSA were noted. Paricalcitol was evaluated on a 3 × per week schedule. This schedule and dose of paricalcitol proved to be very safe and well tolerated, but PSA responses were not seen; parathyroid hormone (PTH) levels were suppressed, indicating biologic activity of this dose and schedule. While limited data exist that single-agent calcitriol or its analogs have important clinical activity, these trials clearly demonstrate that calcitriol can be administered at a very high dose on an intermittent schedule and that the safe dose of calcitriol administered can be increased if concomitant glucocorticoids are employed. The now defunct pharmaceutical company Novocea developed a new formulation of calcitriol referred to as DN-101. This formulation was carefully studied and provided a linear relationship between dose and systemic exposure over a wide dose range. 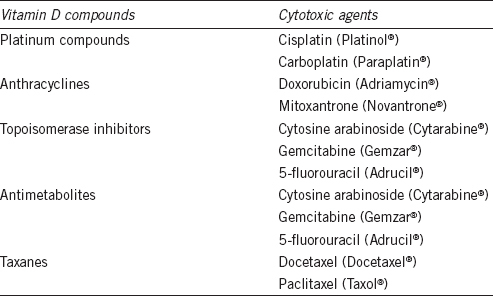 Many classes of agents are synergistic or additive in preclinical studies providing strong rationale for combinations of calcitriol and cytotoxic agents [Table 3]. Examination of the sequence of trials with vitamin D compounds and cytotoxic agents illustrates the challenges of drug development.,,, There was limited pharmaceutical company interest in such studies; hence, resources for the conduct of such trials were limited. This led to the conduct of many small, Phase 2 trials often with less than maximal (and hence likely suboptimal) doses of calcitriol. Novocea, to its credit, initiated randomized Phase III trials as soon as a safe and pharmacologically dependable dose of DN-101 was determined. However, the dose of DN-101 chosen was based on convenience, not scientific data. In light of safety and response rate seen in a single-institution trial of calcitriol (0.5 mcg kg −1 day 1) + docetaxel (day 1), Novocea conducted a randomized Phase III study (ASCENT I) to determine the PSA response rate (defined as a >50% decline in PSA for >1 month) following standard therapy for CRPC (docetaxel 36 mg sqm −1 weekly intravenously × 4 weeks every 6 weeks) compared to the same dose and schedule of docetaxel + calcitriol (DN-101), 45 mcg weekly. The dose of DN-101 was based on the safety and response rate in the earlier calcitriol trial and the fact that transient, asymptomatic, and readily reversible hypercalcemia (Grade 2) occurred in 2 of 6 patients treated with 60 mcg of DN-101. Two hundred and fifty patients were randomized. PSA response rates were 63% (DN-101) and 52% (placebo) (P = 0.07). While the primary goal (superior PSA response for DN-101 + docetaxel) of this trial was not achieved, there was a numeric difference in the PSA response rate favoring the DN-101 arm. While survival was not a primary endpoint of this trial, patients receiving DN-101 did fare better. The median survival for the placebo arm was around 16.4 months and for the DN-101 arm around 24.5 months. Hazard rate for death in the DN-101 group was 0.67 (P = 0.04). All toxicities appeared equal between the two arms and no limiting hypercalcemia was noted. These results were encouraging, especially in view of the fact that this was a relatively large, randomized trial. However, drug approval was not possible based on this trial. A larger trial was initiated (ASCENT II) in order to evaluate the apparent survival advantage of DN-101 + docetaxel. When ASCENT II was designed, the weekly docetaxel regimen employed in ASCENT I had been shown to be inferior in terms of patient survival compared to an every 3-week regimen (75 mg sqm −1 every 3 weeks). There are no data that indicate that the dose of calcitriol administered in ASCENT II was biologically or therapeutically ideal. The dose studied was less than 50% of the maximum tolerated dose of calcitriol that can be given on an intermittent schedule. The dose of calcitriol chosen was based on a study of 37 patients by Beer and colleagues which demonstrated an 81% response rate in CRPC, and the Phase 1 study of DN-101 which determined that the appropriate dose of this calcitriol formulation was 45 mcg weekly – based on the occurrence of Grade 2 hypercalcemia (11.6–12.5 mg dl −1) in 2 of 6 patients treated with 60 mcg of calcitriol as DN-101. Many would view this as an overly conservative definition of tolerable dose for use in men with advanced cancer. Ramnath et al. safely administered 80 mcg sqm −1 (~120 mcg total dose) of calcitriol intravenously with docetaxel and cisplatin and no patient had hypercalcemia. Myelosuppression was the limiting toxicity in that trial, very likely related solely to the cytotoxic agents. Muindi et al. and Fakih et al. studied intravenous calcitriol weekly with gefitinib (Iressa®), an oral epidermal growth factor tyrosine kinase inhibitor. 74 mcg weekly alone and 125 mcg weekly with dexamethasone were the defined “Phase II” doses. The ASCENT I and II trials were done with a dose of calcitriol that was one-quarter to one-half the calcitriol dose that would have been safe. Considerable evidence in preclinical studies indicates that the anticancer effect of calcitriol is dose/exposure related. In another double-blind, randomized study, Attia and colleagues compared docetaxel plus 1-alpha hydroxyvitamin D2(doxercalciferol) to docetaxel plus placebo in patients with CRPC receiving weekly docetaxel. Doxercalciferol was administered orally, 10 mcg daily. Seventy patients were randomized to doxercalciferol or placebo. While this dose and schedule of doxercalciferol was safe and well tolerated, no benefit of the vitamin D compound was seen. PSA response rate was 39.4% for the placebo arm and 46.7% for the doxercalciferol arm; survival was 17.8 and 16.4 months in the vitamin D and placebo arms, respectively. There are considerable data indicating the importance of vitamin D signaling in prostate cancer. Vitamin D signaling is a plausible target for the treatment of established cancers – either as vitamin D agents alone or such agents combined with other antineoplastic agents. Careful studies of vitamin D supplementation will be required to determine whether these biologic observations can be translated into prevention strategies. Unfortunately, there is limited information regarding the role of vitamin D compounds in the treatment of prostate cancer. Two approaches could be employed to refine the clinical studies of vitamin D in prostate cancer: (1) studies which establish dependable biomarkers of vitamin D response would allow selection of patients with a greater likelihood of response and (2) well-designed clinical trials of biologically appropriate doses of vitamin D compounds are needed. Existing data strongly support the continued development of these approaches. The authors thank the patients who have participated in their clinical trials and many past collaborators. Rubin D, Levij IS. Suppression by vitamins D2 and D3 of hamster cheek pouch carcinoma induced with 9,10-dimethyl-1,2-benzanthracene with a discussion of the role of intracellular calcium in the development of tumors. Pathol Microbiol (Basel) 1973; 39: 446–60. Murphy LC, Wild J, Posen S, Stone G. 25-Hydroxycholecalciferol receptors in human breast cancer. Br J Cancer 1979; 39: 531–5. Colston K, Colston MJ, Feldman D. 1,25-dihydroxyvitamin D3 and malignant melanoma: the presence of receptors and inhibition of cell growth in culture. Endocrinology 1981; 108: 1083–6. Powe CE, Evans MK, Wenger J, Zonderman AB, Berg AH, et al. Vitamin D-binding protein and vitamin D status of black Americans and white Americans. N Engl J Med 2013; 369: 1991–2000. Olsson I, Gullberg U, Ivhed I, Nilsson K. Induction of differentiation of the human histiocytic lymphoma cell line U-937 by 1 alpha,25-dihydroxycholecalciferol. Cancer Res 1983; 43: 5862–7. Wang QM, Jones JB, Studzinski GP. Cyclin-dependent kinase inhibitor p27 as a mediator of the G1-S phase block induced by 1,25-dihydroxyvitamin D3 in HL60 cells. Cancer Res 1996; 56: 264–7. Simboli-Campbell M, Narvaez CJ, van Weelden K, Tenniswood M, Welsh J. Comparative effects of 1,25(OH)2D3 and EB1089 on cell cycle kinetics and apoptosis in MCF-7 breast cancer cells. Breast Cancer Res Treat 1997; 42: 31–41. Verlinden L, Verstuyf A, Convents R, Marcelis S, Van Camp M, et al. Action of 1,25(OH)2D3 on the cell cycle genes, cyclin D1, p21 and p27 in MCF-7 cells. Mol Cell Endocrinol 1998; 142: 57–65. Bernardi RJ, Trump DL, Yu WD, McGuire TF, Hershberger PA, et al. Combination of 1alpha,25-dihydroxyvitamin D(3) with dexamethasone enhances cell cycle arrest and apoptosis: role of nuclear receptor cross-talk and Erk/Akt signaling. Clin Cancer Res 2001; 7: 4164–73. Welsh J. Induction of apoptosis in breast cancer cells in response to vitamin D and antiestrogens. Biochem Cell Biol 1994; 72: 537–45. James SY, Mackay AG, Colston KW. Effects of 1,25 dihydroxyvitamin D3 and its analogues on induction of apoptosis in breast cancer cells. J Steroid Biochem Mol Biol 1996; 58: 395–401. Pintado CO, Carracedo J, Rodriguez M, Perez-Calderon R, Ramirez R. 1 alpha, 25-dihydroxyvitamin D3 (calcitriol) induces apoptosis in stimulated T cells through an IL-2 dependent mechanism. Cytokine 1996; 8: 342–5. Narvaez CJ, Welsh J. Differential effects of 1,25-dihydroxyvitamin D3 and tetradecanoylphorbol acetate on cell cycle and apoptosis of MCF-7 cells and a vitamin D3 resistant variant. Endocrinology 1997; 138: 4690–8. Colston KW, Hansen CM. Mechanisms implicated in the growth regulatory effects of vitamin D in breast cancer. Endocr Relat Cancer 2002; 9: 45–59. Johnson CS, Muindi JR, Hershberger PA, Trump DL. The antitumor efficacy of calcitriol: preclinical studies. Anticancer Res 2006; 26: 2543–9. Miyata Y, Ohba K, Matsuo T, Watanabe S, Hayashi T, et al. Tumor-associated stromal cells expressing E-prostanoid 2 or 3 receptors in prostate cancer: correlation with tumor aggressiveness and outcome by angiogenesis and lymphangiogenesis. Urology 2013; 81: 136–42. Chung I, Han G, Seshadri M, Gillard BM, Yu WD, et al. Role of vitamin D receptor in the antiproliferative effects of calcitriol in tumor-derived endothelial cells and tumor angiogenesis in vivo. Cancer Res 2009; 69: 967–75. Hou YF, Gao SH, Wang P, Zhang HM, Liu LZ, et al. 1α,25(OH)2D3 suppresses the migration of ovarian cancer SKOV-3 cells through the inhibition of epithelial-mesenchymal transition. Int J Mol Sci 2016; 17. pii: E1285. Chen S, Zhu J, Zuo S, Ma J, Zhang J, et al. 1,25(OH)2D3 attenuates TGFbeta1/beta2-induced increased migration and invasion via inhibiting epithelial-mesenchymal transition in colon cancer cells. Biochem Biophys Res Commun 2015; 468: 130–5. Koeffler HP, Hirji K, Itri L. 1,25-Dihydroxyvitamin D3:in vivo andin vitro effects on human preleukemic and leukemic cells. Cancer Treat Rep 1985; 69: 1399–407. Abe J, Moriya Y, Saito M, Sugawara Y, Suda T, et al. Modulation of cell growth, differentiation, and production of interleukin-3 by 1 alpha,25-dihydroxyvitamin D3 in the murine myelomonocytic leukemia cell line WEHI-3. Cancer Res 1986; 46: 6316–21. Irani M, Seifer DB, Grazi RV, Julka N, Bhatt D, et al. Vitamin D supplementation decreases TGF-beta1 bioavailability in PCOS: a Randomized Placebo-Controlled Trial. J Clin Endocrinol Metab 2015; 100: 4307–14. Chen PT, Hsieh CC, Wu CT, Yen TC, Lin PY, et al. 1alpha,25-Dihydroxyvitamin D3 inhibits esophageal squamous cell carcinoma progression by reducing IL6 signaling. Mol Cancer Ther 2015; 14: 1365–75. Mohapatra S, Saxena A, Gandhi G, Koner BC, Singh T, et al. Does vitamin D mediate inhibition of epithelial ovarian cancer by modulating cytokines? Clin Transl Oncol 2015; 17: 590–5. Gonzalez-Cao M, Karachaliou N, Viteri S, Morales-Espinosa D, Teixido C, et al. Targeting PD-1/PD-L1 in lung cancer: current perspectives. Lung Cancer (Auckl) 2015; 6: 55–70. Tran E, Robbins PF, Rosenberg SA. 'Final common pathway' of human cancer immunotherapy: targeting random somatic mutations. Nat Immunol 2017; 18: 255–62. Byun DJ, Wolchok JD, Rosenberg LM, Girotra M. Cancer immunotherapy-immune checkpoint blockade and associated endocrinopathies. Nat Rev Endocrinol 2017; 13: 195–207. Wang W, Bergh A, Damber JE. Cyclooxygenase-2 expression correlates with local chronic inflammation and tumor neovascularization in human prostate cancer. Clin Cancer Res 2005; 11: 3250–6. Zha S, Gage WR, Sauvageot J, Saria EA, Putzi MJ, et al. Cyclooxygenase-2 is up-regulated in proliferative inflammatory atrophy of the prostate, but not in prostate carcinoma. Cancer Res 2001; 61: 8617–23. Gupta S, Srivastava M, Ahmad N, Bostwick DG, Mukhtar H. Over-expression of cyclooxygenase-2 in human prostate adenocarcinoma. Prostate 2000; 42: 73–8. Yoshimura R, Sano H, Masuda C, Kawamura M, Tsubouchi Y, et al. Expression of cyclooxygenase-2 in prostate carcinoma. Cancer 2000; 89: 589–96. Krishnan AV, Feldman D. Molecular pathways mediating the anti-inflammatory effects of calcitriol: implications for prostate cancer chemoprevention and treatment. Endocr Relat Cancer 2010; 17: R19–38. Krishnan AV, Srinivas S, Feldman D. Inhibition of prostaglandin synthesis and actions contributes to the beneficial effects of calcitriol in prostate cancer. Dermatoendocrinol 2009; 1: 7–11. Moreno J, Krishnan AV, Swami S, Nonn L, Peehl DM, et al. Regulation of prostaglandin metabolism by calcitriol attenuates growth stimulation in prostate cancer cells. Cancer Res 2005; 65: 7917–25. Nonn L, Peng L, Feldman D, Peehl DM. Inhibition of p38 by vitamin D reduces interleukin-6 production in normal prostate cells via mitogen-activated protein kinase phosphatase 5: implications for prostate cancer prevention by vitamin D. Cancer Res 2006; 66: 4516–24. Aparna R, Subhashini J, Roy KR, Reddy GS, Robinson M, et al. Selective inhibition of cyclooxygenase-2 (COX-2) by 1alpha,25-dihydroxy-16-ene-23-yne-vitamin D3, a less calcemic vitamin D analog. J Cell Biochem 2008; 104: 1832–42. Doherty D, Dvorkin SA, Rodriguez EP, Thompson PD. Vitamin D receptor agonist EB1089 is a potent regulator of prostatic “intracrine” metabolism. Prostate 2014; 74: 273–85. Seo YK, Mirkheshti N, Song CS, Kim S, Dodds S, et al. SULT2B1b sulfotransferase: induction by vitamin D receptor and reduced expression in prostate cancer. Mol Endocrinol 2013; 27: 925–39. Maguire O, Pollock C, Martin P, Owen A, Smyth T, et al. Regulation of CYP3A4 and CYP3A5 expression and modulation of “intracrine” metabolism of androgens in prostate cells by liganded vitamin D receptor. Mol Cell Endocrinol 2012; 364: 54–64. Skowronski RJ, Peehl DM, Feldman D. Actions of vitamin D3, analogs on human prostate cancer cell lines: comparison with 1,25-dihydroxyvitamin D3. Endocrinology 1995; 136: 20–6. Campbell MJ, Reddy GS, Koeffler HP. Vitamin D3 analogs and their 24-oxo metabolites equally inhibit clonal proliferation of a variety of cancer cells but have differing molecular effects. J Cell Biochem 1997; 66: 413–25. Berkovich L, Sintov AC, Ben-Shabat S. Inhibition of cancer growth and induction of apoptosis by BGP-13 and BGP-15, new calcipotriene-derived vitamin D3 analogs, in-vitro and in-vivo studies. Invest New Drugs 2013; 31: 247–55. Okamoto R, Delansorne R, Wakimoto N, Doan NB, Akagi T, et al. Inecalcitol, an analog of 1alpha,25(OH)(2)D(3), induces growth arrest of androgen-dependent prostate cancer cells. Int J Cancer 2012; 130: 2464–73. Verlinden L, Verstuyf A, Van Camp M, Marcelis S, Sabbe K, et al. Two novel 14-Epi-analogues of 1,25-dihydroxyvitamin D3 inhibit the growth of human breast cancer cellsin vitro and in vivo. Cancer Res 2000; 60: 2673–9. Van Belle TL, Vanherwegen AS, Feyaerts D, De Clercq P, Verstuyf A, et al. 1,25-Dihydroxyvitamin D3 and its analog TX527 promote a stable regulatory T cell phenotype in T cells from type 1 diabetes patients. PLoS One 2014; 9: e109194. Ferreira GB, Overbergh L, Verstuyf A, Mathieu C. 1alpha,25-Dihydroxyvitamin D3 and its analogs as modulators of human dendritic cells: a comparison dose-titration study. J Steroid Biochem Mol Biol 2013; 136: 160–5. Verlinden L, Leyssens C, Beullens I, Marcelis S, Mathieu C, et al. The vitamin D analog TX527 ameliorates disease symptoms in a chemically induced model of inflammatory bowel disease. J Steroid Biochem Mol Biol 2013; 136: 107–11. Medioni J, Deplanque G, Ferrero JM, Maurina T, Rodier JM, et al. Phase I safety and pharmacodynamic of inecalcitol, a novel VDR agonist with docetaxel in metastatic castration-resistant prostate cancer patients. Clin Cancer Res 2014; 20: 4471–7. Medioni J, Deplanque G, Ferrero J, Maurina T, Rodier JP, et al. Dose-finding and efficacy phase II study of inecalcitol, a new VDR agonist, in combination with docetaxel-prednisone regimen for castration-resistant prostate cancer (CRPC) patients (pts). J Clin Oncol 2011; 29 15 Suppl: 4605. Ma Y, Yu WD, Hidalgo AA, Luo W, Delansorne R, et al. Inecalcitol, an analog of 1,25D3, displays enhanced antitumor activity through the induction of apoptosis in a squamous cell carcinoma model system. Cell Cycle 2013; 12: 743–52. Farhan H, Wahala K, Cross HS. Genistein inhibits vitamin D hydroxylases CYP24 and CYP27B1 expression in prostate cells. J Steroid Biochem Mol Biol 2003; 84: 423–9. Swami S, Krishnan AV, Moreno J, Bhattacharyya RB, Peehl DM, et al. Calcitriol and genistein actions to inhibit the prostaglandin pathway: potential combination therapy to treat prostate cancer. J Nutr 2007; 137: 205S–10S. Kaiser MF, Heider U, Mieth M, Zang C, von Metzler I, et al. The proteasome inhibitor bortezomib stimulates osteoblastic differentiation of human osteoblast precursors via upregulation of vitamin D receptor signalling. Eur J Haematol 2013; 90: 263–72. Hedlund TE, Moffatt KA, Miller GJ. Vitamin D receptor expression is required for growth modulation by 1 alpha,25-dihydroxyvitamin D3 in the human prostatic carcinoma cell line ALVA-31. J Steroid Biochem Mol Biol 1996; 58: 277–88. Zhang Q, Kanterewicz B, Buch S, Petkovich M, Parise R, et al. CYP24 inhibition preserves 1alpha,25-dihydroxyvitamin D(3) anti-proliferative signaling in lung cancer cells. Mol Cell Endocrinol 2012; 355: 153–61. Peehl DM, Seto E, Hsu JY, Feldman D. Preclinical activity of ketoconazole in combination with calcitriol or the vitamin D analogue EB 1089 in prostate cancer cells. J Urol 2002; 168: 1583–8. Swami S, Krishnan AV, Peehl DM, Feldman D. Genistein potentiates the growth inhibitory effects of 1,25-dihydroxyvitamin D3 in DU145 human prostate cancer cells: role of the direct inhibition of CYP24 enzyme activity. Mol Cell Endocrinol 2005; 241: 49–61. Muindi JR, Yu WD, Ma Y, Engler KL, Kong RX, et al. CYP24A1 inhibition enhances the antitumor activity of calcitriol. Endocrinology 2010; 151: 4301–12. Chiellini G, Rapposelli S, Zhu J, Massarelli I, Saraceno M, et al. Synthesis and biological activities of vitamin D-like inhibitors of CYP24 hydroxylase. Steroids 2012; 77: 212–23. Komagata S, Nakajima M, Takagi S, Mohri T, Taniya T, et al. Human CYP24 catalyzing the inactivation of calcitriol is post-transcriptionally regulated by miR-125b. Mol Pharmacol 2009; 76: 702–9. Lechner D, Manhardt T, Bajna E, Posner GH, Cross HS. A 24-phenylsulfone analog of vitamin D inhibits 1alpha,25-dihydroxyvitamin D(3) degradation in vitamin D metabolism-competent cells. J Pharmacol Exp Ther 2007; 320: 1119–26. Yee SW, Simons C. Synthesis and CYP24 inhibitory activity of 2-substituted-3,4-dihydro-2H-naphthalen-1-one (tetralone) derivatives. Bioorg Med Chem Lett 2004; 14: 5651–4. Schuster I, Egger H, Nussbaumer P, Kroemer RT. Inhibitors of vitamin D hydroxylases: structure-activity relationships. J Cell Biochem 2003; 88: 372–80. Ajibade AA, Kirk JS, Karasik E, Gillard B, Moser MT, et al. Early growth inhibition is followed by increased metastatic disease with vitamin D (calcitriol) treatment in the TRAMP model of prostate cancer. PLoS One 2014; 9: e89555. Trump DL, Hershberger PA, Bernardi RJ, Ahmed S, Muindi J, et al. Anti-tumor activity of calcitriol: pre-clinical and clinical studies. J Steroid Biochem Mol Biol 2004; 89-90: 519–26. Ly LH, Zhao XY, Holloway L, Feldman D. Liarozole acts synergistically with 1alpha,25-dihydroxyvitamin D3 to inhibit growth of DU 145 human prostate cancer cells by blocking 24-hydroxylase activity. Endocrinology 1999; 140: 2071–6. Zhao J, Tan BK, Marcelis S, Verstuyf A, Bouillon R. Enhancement of antiproliferative activity of 1alpha,25-dihydroxyvitamin D3 (analogs) by cytochrome P450 enzyme inhibitors is compound- and cell-type specific. J Steroid Biochem Mol Biol 1996; 57: 197–202. Rao A, Woodruff RD, Wade WN, Kute TE, Cramer SD. Genistein and vitamin D synergistically inhibit human prostatic epithelial cell growth. J Nutr 2002; 132: 3191–4. Rodriguez GC, Turbov J, Rosales R, Yoo J, Hunn J, et al. Progestins inhibit calcitriol-induced CYP24A1 and synergistically inhibit ovarian cancer cell viability: an opportunity for chemoprevention. Gynecol Oncol 2016; 143: 159–67. Lee LR, Teng PN, Nguyen H, Hood BL, Kavandi L, et al. Progesterone enhances calcitriol antitumor activity by upregulating vitamin D receptor expression and promoting apoptosis in endometrial cancer cells. Cancer Prev Res (Phila) 2013; 6: 731–43. Lou YR, Tuohimaa P. Androgen enhances the antiproliferative activity of vitamin D3 by suppressing 24-hydroxylase expression in LNCaP cells. J Steroid Biochem Mol Biol 2006; 99: 44–9. Yee SW, Campbell MJ, Simons C. Inhibition of Vitamin D3 metabolism enhances VDR signalling in androgen-independent prostate cancer cells. J Steroid Biochem Mol Biol 2006; 98: 228–35. Srinivas S, Feldman D. A phase II trial of calcitriol and naproxen in recurrent prostate cancer. Anticancer Res 2009; 29: 3605–10. Gocek E, Marchwicka A, Baurska H, Chrobak A, Marcinkowska E. Opposite regulation of vitamin D receptor by ATRA in AML cells susceptible and resistant to vitamin D-induced differentiation. J Steroid Biochem Mol Biol 2012; 132: 220–6. Mernitz H, Smith DE, Wood RJ, Russell RM, Wang XD. Inhibition of lung carcinogenesis by 1alpha,25-dihydroxyvitamin D3 and 9-cis retinoic acid in the A/J mouse model: evidence of retinoid mitigation of vitamin D toxicity. Int J Cancer 2007; 120: 1402–9. Mouratidis PX, Dalgleish AG, Colston KW. Investigation of the mechanisms by which EB1089 abrogates apoptosis induced by 9-cis retinoic acid in pancreatic cancer cells. Pancreas 2006; 32: 93–100. Peehl DM, Feldman D. Interaction of nuclear receptor ligands with the vitamin D signaling pathway in prostate cancer. J Steroid Biochem Mol Biol 2004; 92: 307–15. Ikeda N, Uemura H, Ishiguro H, Hori M, Hosaka M, et al. Combination treatment with 1alpha,25-dihydroxyvitamin D3 and 9-cis-retinoic acid directly inhibits human telomerase reverse transcriptase transcription in prostate cancer cells. Mol Cancer Ther 2003; 2: 739–46. Elstner E, Campbell MJ, Munker R, Shintaku P, Binderup L, et al. Novel 20-epi-vitamin D3 analog combined with 9-cis-retinoic acid markedly inhibits colony growth of prostate cancer cells. Prostate 1999; 40: 141–9. Kommagani R, Payal V, Kadakia MP. Differential regulation of vitamin D receptor (VDR) by the p53 family: p73-dependent induction of VDR upon DNA damage. J Biol Chem 2007; 282: 29847–54. Smith DC, Johnson CS, Freeman CC, Muindi J, Wilson JW, et al. A phase I trial of calcitriol (1,25-dihydroxycholecalciferol) in patients with advanced malignancy. Clin Cancer Res 1999; 5: 1339–45. Johnson CS, Hershberger PA, Bernardi RJ, McGuire TF, Trump DL. Vitamin D receptor: a potential target for intervention. Urology 2002; 60: 123–30. [Discussion 30-1]. Muindi JR, Peng Y, Potter DM, Hershberger PA, Tauch JS, et al. Pharmacokinetics of high-dose oral calcitriol: results from a phase 1 trial of calcitriol and paclitaxel. Clin Pharmacol Ther 2002; 72: 648–59. Muindi JR, Potter DM, Peng Y, Johnson CS, Trump DL. Pharmacokinetics of liquid calcitriol formulation in advanced solid tumor patients: comparison with caplet formulation. Cancer Chemother Pharmacol 2005; 56: 492–6. Muindi JR, Johnson CS, Trump DL, Christy R, Engler KL, et al. A phase I and pharmacokinetics study of intravenous calcitriol in combination with oral dexamethasone and gefitinib in patients with advanced solid tumors. Cancer Chemother Pharmacol 2009; 65: 33–40. Fakih MG, Trump DL, Muindi JR, Black JD, Bernardi RJ, et al. A phase I pharmacokinetic and pharmacodynamic study of intravenous calcitriol in combination with oral gefitinib in patients with advanced solid tumors. Clin Cancer Res 2007; 13: 1216–23. Chan JS, Beer TM, Quinn DI, Pinski JK, Garzotto M, et al. A phase II study of high-dose calcitriol combined with mitoxantrone and prednisone for androgen-independent prostate cancer. BJU Int 2008; 102: 1601–6. Muindi JR, Modzelewski RA, Peng Y, Trump DL, Johnson CS. Pharmacokinetics of 1alpha,25-dihydroxyvitamin D3 in normal mice after systemic exposure to effective and safe antitumor doses. Oncology 2004; 66: 62–6. Dunlap N, Schwartz GG, Eads D, Cramer SD, Sherk AB, et al. 1alpha,25-dihydroxyvitamin D(3) (calcitriol) and its analogue, 19-nor-1alpha,25(OH)(2)D(2), potentiate the effects of ionising radiation on human prostate cancer cells. Br J Cancer 2003; 89: 746–53. Anand S, Rollakanti KR, Horst RL, Hasan T, Maytin EV. Combination of oral vitamin D3 with photodynamic therapy enhances tumor cell death in a murine model of cutaneous squamous cell carcinoma. Photochem Photobiol 2014; 90: 1126–35. Osborn JL, Schwartz GG, Smith DC, Bahnson R, Day R, et al. Phase II trial of oral 1,25-dihydroxyvitamin D (calcitriol) in hormone refractory prostate cancer. Urol Oncol 1995; 1: 195–8. Chadha MK, Tian L, Mashtare T, Payne V, Silliman C, et al. Phase 2 trial of weekly intravenous 1,25 dihydroxy cholecalciferol (calcitriol) in combination with dexamethasone for castration-resistant prostate cancer. Cancer 2010; 116: 2132–9. Trump DL, Potter DM, Muindi J, Brufsky A, Johnson CS. Phase II trial of high-dose, intermittent calcitriol (1,25 dihydroxyvitamin D3) and dexamethasone in androgen independent prostate cancer. Cancer 2006; 106: 2136–42. Morris MJ, Smaletz O, Solit D, Kelly WK, Slovin S, et al. High-dose calcitriol, zoledronate, and dexamethasone for the treatment of progressive prostate carcinoma. Cancer 2004; 100: 1868–75. Gross C, Stamey T, Hancock S, Feldman D. Treatment of early recurrent prostate cancer with 1,25-dihydroxyvitamin D3 (calcitriol). J Urol 1998; 159: 2035–9. [Discussion 9-40]. Schwartz GG, Hall MC, Stindt D, Patton S, Lovato J, et al. Phase I/II study of 19-nor1alpha-25-dihydroxyvitamin D2 (paricalcitol) in advanced, androgen-insensitive prostate cancer. Clin Cancer Res 2005; 11: 8680–5. Beer TM, Lemmon D, Lowe BA, Henner WD. High-dose weekly oral calcitriol in patients with a rising PSA after prostatectomy or radiation for prostate carcinoma. Cancer 2003; 97: 1217–24. Liu G, Wilding G, Staab MJ, Horvath D, Miller K, et al. Phase II study of 1alpha hydroxyvitamin D (2) in the treatment of advanced androgen-independent prostate cancer. Clin Cancer Res 2003; 9: 4077–83. Fizazi K, Jones R, Oudard S, Efstathiou E, Saad F, et al. Phase III, randomized, double-blind, multicenter trial comparing orteronel (TAK-700) plus prednisone with placebo plus prednisone in patients with metastatic castration-resistant prostate cancer that has progressed during or after docetaxel-based therapy: ELM-PC 5. J Clin Oncol 2015; 33: 723–31. Smith M, De Bono J, Sternberg C, Le Moulec S, Oudard S, et al. Phase III study of cabozantinib in previously treated metastatic castration-resistant prostate cancer: COMET-1. J Clin Oncol 2016; 34: 3005–13. Kantoff PW, Halabi S, Conaway M, Picus J, Kirshner J, et al. Hydrocortisone with or without mitoxantrone in men with hormone-refractory prostate cancer: results of the cancer and leukemia group B 9182 study. J Clin Oncol 1999; 17: 2506–13. Venkitaraman R, Lorente D, Murthy V, Thomas K, Parker L, et al. A randomised phase 2 trial of dexamethasone versus prednisolone in castration-resistant prostate cancer. Eur Urol 2015; 67: 673–9. Sartor O, Weinberger M, Moore A, Li A, Figg WD. Effect of prednisone on prostate-specific antigen in patients with hormone-refractory prostate cancer. Urology 1998; 52: 252–6. Morioka M, Kobayashi T, Furukawa Y, Jo Y, Shinkai M, et al. Prostate-specific antigen levels and prognosis in patients with hormone-refractory prostate cancer treated with low-dose dexamethasone. Urol Int 2002; 68: 10–5. Saika T, Kusaka N, Tsushima T, Yamato T, Ohashi T, et al. Treatment of androgen-independent prostate cancer with dexamethasone: a prospective study in stage D2 patients. Int J Urol 2001; 8: 290–4. Beer TM, Munar M, Henner WD. A phase I trial of pulse calcitriol in patients with refractory malignancies: pulse dosing permits substantial dose escalation. Cancer 2001; 91: 2431–9. Beer TM, Javle MM, Ryan CW, Garzotto M, Lam GN, et al. Phase I study of weekly DN-101, a new formulation of calcitriol, in patients with cancer. Cancer Chemother Pharmacol 2007; 59: 581–7. Beer TM, Eilers KM, Garzotto M, Egorin MJ, Lowe BA, et al. Weekly high-dose calcitriol and docetaxel in metastatic androgen-independent prostate cancer. J Clin Oncol 2003; 21: 123–8. Flaig TW, Barqawi A, Miller G, Kane M, Zeng C, et al. A phase II trial of dexamethasone, vitamin D, and carboplatin in patients with hormone-refractory prostate cancer. Cancer 2006; 107: 266–74. Trump DL, Brady WE, Aragon-Ching JB, Pili R, Levine EG, et al. A phase I/II trial of ketoconazole + calcitriol [1,25(OH)2D3] in castration-resistant prostate cancer. J Clin Oncol 2016; 34: 5065. Beer TM, Garzotto M, Katovic NM. High-dose calcitriol and carboplatin in metastatic androgen-independent prostate cancer. Am J Clin Oncol 2004; 27: 535–41. Scher HI, Jia X, Chi K, de Wit R, Berry WR, et al. Randomized, open-label phase III trial of docetaxel plus high-dose calcitriol versus docetaxel plus prednisone for patients with castration-resistant prostate cancer. J Clin Oncol 2011; 29: 2191–8. Ramnath N, Daignault-Newton S, Dy GK, Muindi JR, Adjei A, et al. A phase I/II pharmacokinetic and pharmacogenomic study of calcitriol in combination with cisplatin and docetaxel in advanced non-small-cell lung cancer. Cancer Chemother Pharmacol 2013; 71: 1173–82. Attia S, Eickhoff J, Wilding G, McNeel D, Blank J, et al. Randomized, double-blinded phase II evaluation of docetaxel with or without doxercalciferol in patients with metastatic, androgen-independent prostate cancer. Clin Cancer Res 2008; 14: 2437–43. Beer TM, Myrthue A, Garzotto M, O'Hara MF, Chin R, et al. Randomized study of high-dose pulse calcitriol or placebo prior to radical prostatectomy. Cancer Epidemiol Biomarkers Prev 2004; 13: 2225–32. Gee J, Bailey H, Kim K, Kolesar J, Havighurst T, et al. Phase II open label, multi-center clinical trial of modulation of intermediate endpoint biomarkers by 1alpha-hydroxyvitamin D2 in patients with clinically localized prostate cancer and high grade pin. Prostate 2013; 73: 970–8. Wagner D, Trudel D, Van der Kwast T, Nonn L, Giangreco AA, et al. Randomized clinical trial of vitamin D3 doses on prostatic vitamin D metabolite levels and ki67 labeling in prostate cancer patients. J Clin Endocrinol Metab 2013; 98: 1498–507. Giangreco AA, Dambal S, Wagner D, Van der Kwast T, Vieth R, et al. Differential expression and regulation of vitamin D hydroxylases and inflammatory genes in prostate stroma and epithelium by 1,25-dihydroxyvitamin D in men with prostate cancer and anin vitro model. J Steroid Biochem Mol Biol 2015; 148: 156–65. Giangreco AA, Vaishnav A, Wagner D, Finelli A, Fleshner N, et al. Tumor suppressor microRNAs, miR-100 and -125b, are regulated by 1,25-dihydroxyvitamin D in primary prostate cells and in patient tissue. Cancer Prev Res (Phila) 2013; 6: 483–94. Dambal S, Giangreco AA, Acosta AM, Fairchild A, Richards Z, et al. microRNAs and DICER1 are regulated by 1,25-dihydroxyvitamin D in prostate stroma. J Steroid Biochem Mol Biol 2017; 167: 192–202.